The property is double glazed and has full central heating which is thermostatically controlled 24 hours a day. All bed linen and towels are included. We have excellent public transport facilities all within walking distance. 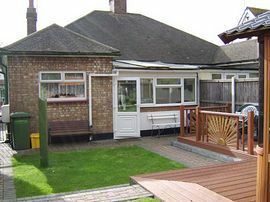 Entry to the bungalow is at the side of the property via a small enclosed porch. The spacious hall leads off to the two bedrooms, lounge and bathroom. 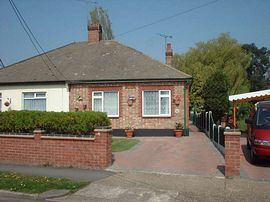 The bedrooms are positioned at the front of the bungalow with the master bedroom containing a double bed. The smaller bedroom contains twin beds. The bathroom contains a white suite with a well positioned electric shower over the bath. The room is three quarter tiled with the remainder of the room benefiting from contrasting paper. A shaver point / light and extractor fan are also provided, with a supporting frame available to fit around the toilet if required. The kitchen is of good size and benefits from colourful decor. There is an electric fan oven and hob with ample units. Further appliances include dishwasher, fridge/freezer, filter coffeemaker, microwave, washing machine and iron/ironing board. The kitchen also has the benefit of a breakfast table and chairs. 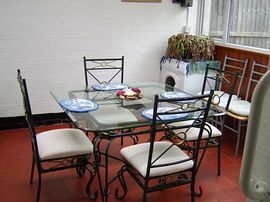 The conservatory is light and airy with a tiled floor. A glass top dinning table and four chairs provide ample space for family meals. There is the added provision of an electric clothes drier here, that is operated by a coin meter. An electric heater provides the warmth in the conservatory in the chillier times. C2C railway line from Fenchurch Street, London, stopping at Benfleet. A13 or A127 from M25 or Dartford tunnel, heading east. £485 - £500 per week all year round. 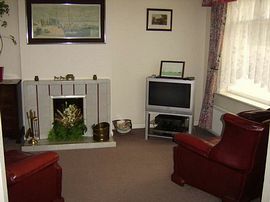 Short breaks £100.00 per night, minimum 2 nights, subject to availability. £100.00 security deposit on all bookings.